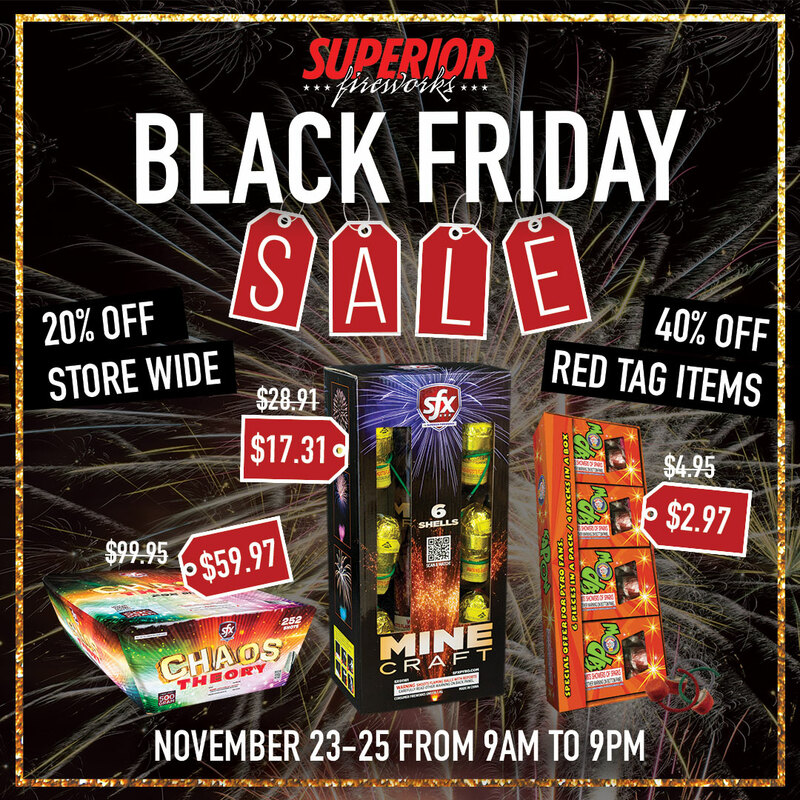 Join us during our 2018 Black Friday Sale to get amazing deals on all of your favorite fireworks for your New Year’s celebration. Our entire store is 20% off all weekend, plus you can also find Red Tag specials throughout the store that are 40% off their normal prices! Our retail store will be open extended hours from 9 am to 9 pm this Friday, Saturday, and Sunday. You can also shop online 24 hours a day on our website, then pick up your order when you are ready. During our Black Friday sale, the entire store is 20% off! That’s right–the entire store. 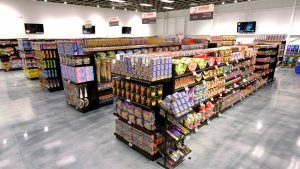 You don’t need any coupons and there are no exceptions or limits as to what or how much you can buy. Plus, if you present a valid military or first responder ID at the time of purchase, your savings jump to 35% off of your entire Black Friday purchase! As if the storewide savings weren’t enough, we are also offering Red Tag specials this Black Friday weekend, saving you 40% off their regular price. These deeply discounted items are only available while supplies last, so shop early to secure these fantastic deals. Below are just a few examples of the great items on Red Tag this weekend. You can find the complete list of the Reg Tag specials here. 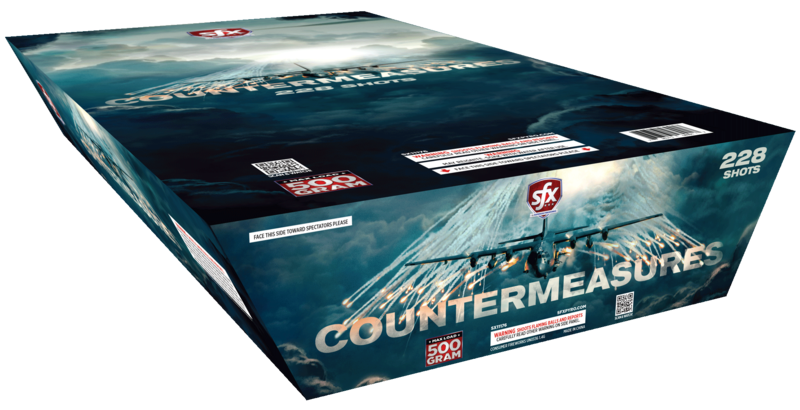 Win a Free Heavy Duty Assortment! 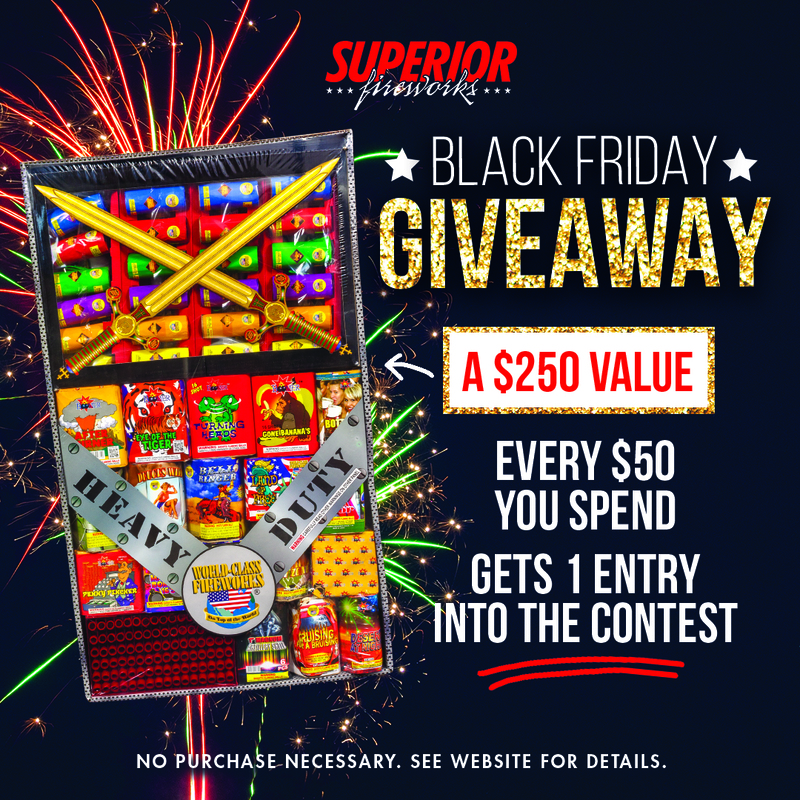 Last but not least, for every $50 you spend between Friday, November 23rd and Sunday, November 25th, you will enter to win our Heavy Duty assortment giveaway! 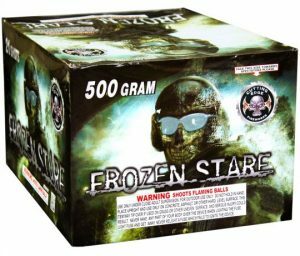 * This large assortment normally retails for $256.70 and comes with eighteen 200-gram repeaters and a complete set of Excalibur artillery shells. 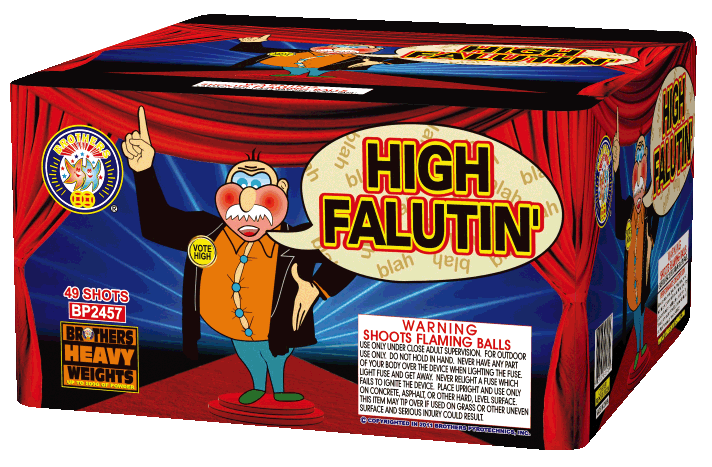 We will announce the winner of the Heavy Duty assortment on Wednesday, November 28th. *No purchase is necessary to enter to win. Please see the full contest rules for details. Black Friday is also a great time for you to check out several exciting new products. The items are new for the 2019 season but have arrived early, giving you an excellent opportunity to grab them before everyone else! 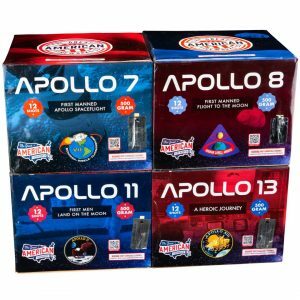 Apollo by The Great American Fireworks Co. includes four hard-hitting 12-Shot, 500-gram repeaters. 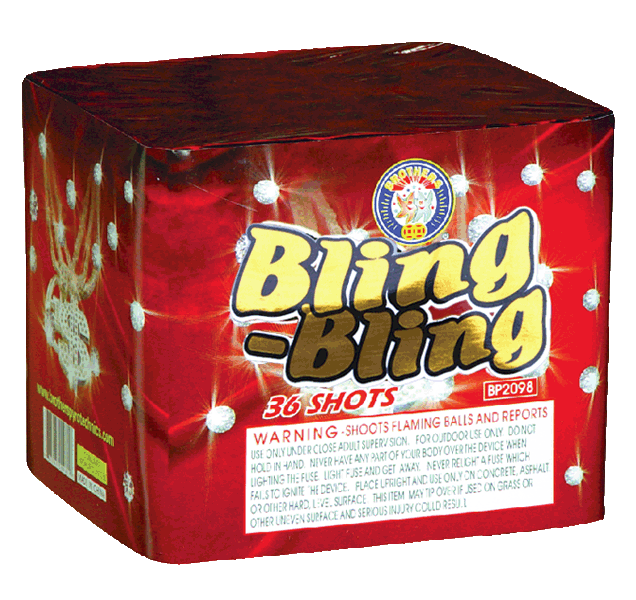 Each repeater features 12 booming 2″ shells, all with glittering tails to gold willows and 3-shot finales. 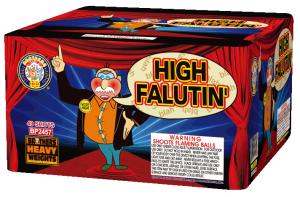 High Falutin’ is a 49-shot, 500-gram repeater from Brothers lasting nearly 60 seconds! It features a display of red, green and blue tails to red, green and blue bouquets, alternating with silver, gold and purple tails to silver glitter, gold willows or crackling. Crackling comet tails are followed by a fourteen-shot finale of crackling tails to crackling flowers. 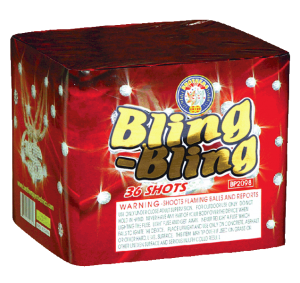 Bling-Bling is a 36-shot, 200-gram repeater from Brothers. It starts with several barrages of whistling snakes and fish with purple, red, blue and white stars. Followed by red and green bouquets with time delay crackle and a 6-shot finale of crackling palms. 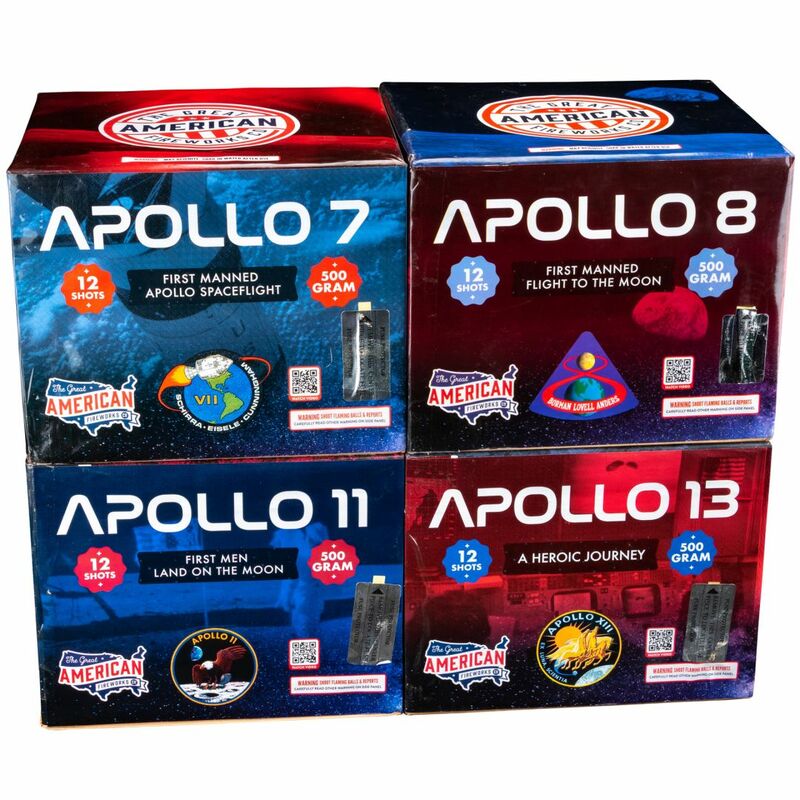 Many of your favorites that were out of stock by the end of the 4th of July season are now back in stock. You might want to buy two or more so always have them on hand! 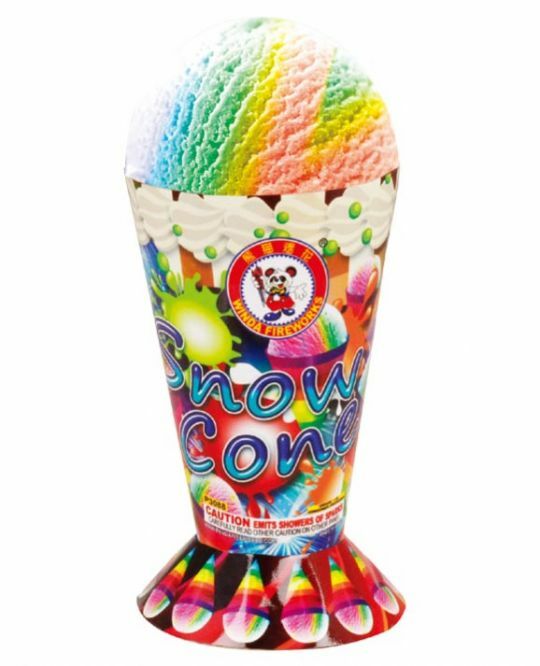 Snow Cone is a fountain from Winda and features various color fish, multi-stage titanium-crackle fountain, powerful gold flitter with blue, red, and green pearls, finishing with a huge crackle finale! It’s always one of our most popular fountains. Countermeasures is a 228-shot, 500-gram Z-Style repeater by SFX Fireworks and showcases a fan-shaped display of red, white, and blue tails to crackle, followed by a criss-crossing wall of red, green, and blue stars with comet tails, finishing with colorful peonies and huge breaks of time rain! 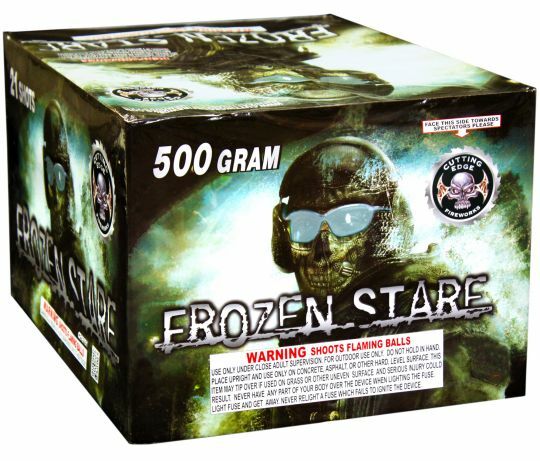 Frozen Stare is a 21-shot, 500-gram repeater by Cutting Edge and fires 7 volleys of 3 shots. The first 6 volleys feature swirling silver comet tails that break into palms with color stars. The last volley unleashes 3 massive, gold brocades for the finale! Q. Is the entire store really on sale? A. Yes! Every item in our store is 20% off all weekend long! Q. Which items are available as 40% off Red Tag specials? A. Dozens of items are part of the Red Tag sale! For a complete list of Black Friday specials, see our Black Friday product page. Q. 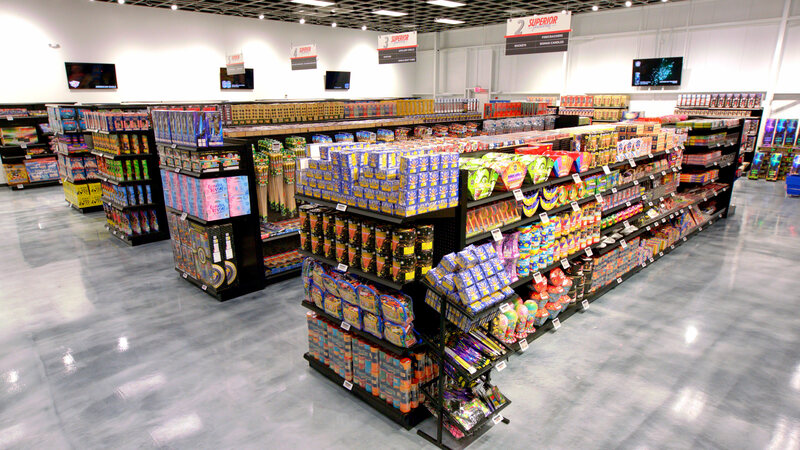 When will the winner of the Heavy Duty assortment be announced? A. We will announce the winner of our Heavy Duty assortment drawing on Wednesday, November 28th. Q. How long will the Black Friday prices last? A. Black Friday prices are valid all weekend from Friday, November 23rd through Sunday, November 25th. However, some items are in limited supply, so shop early to get the products you want! Remember you can start placing online orders as early as 12:01 am on Friday, November 23rd and as late as 11:59 pm on Sunday, November 25th through our online retail store. Q. What are your physical retail store Black Friday weekend hours? A. Our physical retail store Black Friday weekend hours are from 9 a.m. – 9 p.m. including Sunday. Q. If a sale item is out of stock, can I get a rain check? A. Unfortunately, no. All Black Friday specials are available only while supplies last. We know your Black Friday will be busy. To help you plan your visit with us, we recommend creating a wish list with the items you want to purchase. From there you can either print out your wish list to come into the store or move the items to your online shopping cart to buy online. Creating a wish list is easy if you already have an account on our website. If you don’t already have an account, that’s ok, it is really easy to create one here!